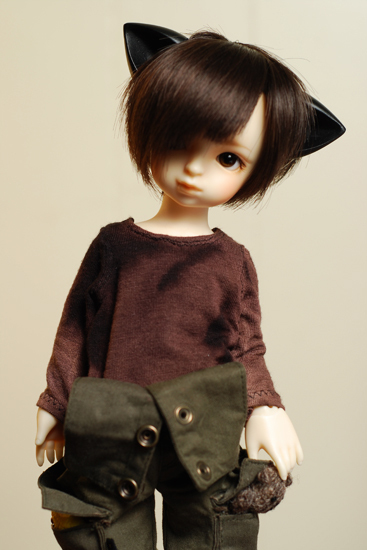 Tsuyoshi with his new kitten ears. After seeing all of the cosplayers running around at Katsu he was feeling a bit left out. These were just terribly cute. Yoshi is more of a little teddy than a kitten so I may try my hands at making him a pair of teddy bear ears a bit later. But for now he’s having fun being a kitten. As you can tell the Mr. has been taking a lot of photos for me, like this one. I’m going to be making a DOA and Etsy update very soon. I have a few pieces left over from the convention that I want to sell as well as putting myself on a regular schedule to make new items and update the shops. I still have a few things to work out first. In the meantime the Mr. took this one last night for me. Tsuyoshi is wearing the new Yo sized bleached shirts I made for Katsu. As difficult as it was to sew at this scale I’m quite happy with the results. There are not enough doll clothing makers out there making cute (but not frou frou) Yo-sized clothes. While I was making Yoshi’s bleached shirt I decided to make a few more for the convention. I have a few left and they will be up on the next update this week. It’s so cute to see it lined up with Aki SD sized version.